The National Farmers’ Day also known as 'Kisan Diwas' is a national occasion observed all over India on 23rd December every year. 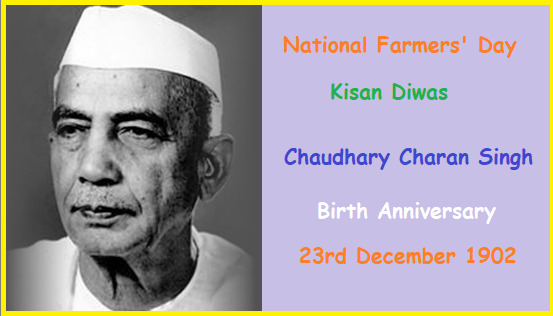 The National Farmers’ Day is celebrated to commemorate the birth anniversary of former 5th Prime Minister of India Chaudhary Charan Singh. The National Farmers’ Day is celebrated all over India, where several debates, events, seminars, functions, competitions and farmer welfare programmes are organised. Late Chaudhary Charan Singh was the fifth Prime Minister of India. He served India's Prime Minister for a very short tenure starting from 28th of July 1979 till 14th January 1980. Chaudhary Charan Singh was a Jat-icon and belongs to a farmers family. He was a simple-minded person and led an extremely simple life. During his tenure as the Prime Minister, he introduced many policies to improve the life of Indian farmers. Chaudhary Charan Singh used to be referred to as the ‘champions of India’s peasants’ for his strive for the betterment of farmer’s lives in India. He was born on 23rd December 1902 in Noopur Uttar Pradesh and died on 29 May 1987, in New Delhi.